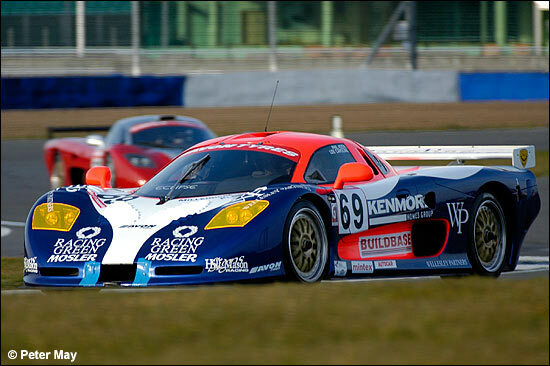 The Eclipse Motorsport Mosler is a familiar British GT machine (especially to dsc readers), while March 22 at Silverstone also saw the first public appearance, in its new livery, of Kevin Riley’s Rollcentre-run Mosler. 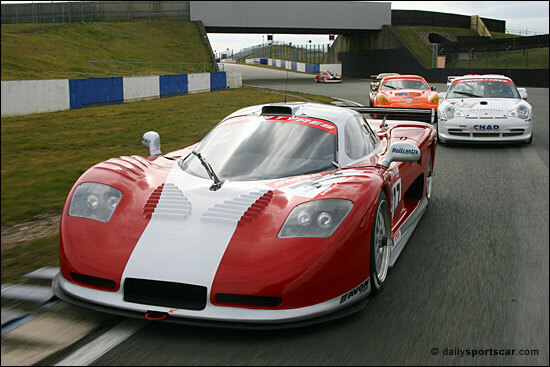 For each of the two MT900Rs (Riley’s is the former Cadena machine), there are significant changes for 2006. 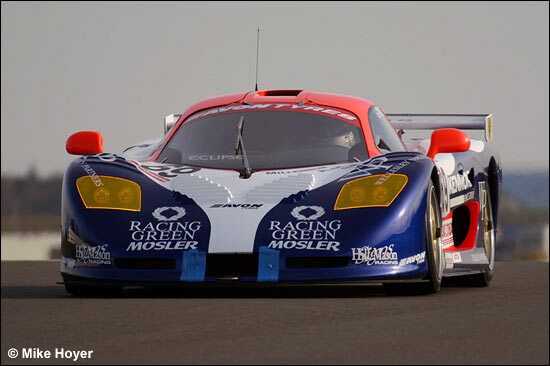 Both, for example, will compete in the entire British GT season. Peter May caught them both on track together. For Eclipse, as announced recently, Phil Keen will be joined by Lee Caroline. Phil Keen, using the Avons for the first time, was fastest man at the test, a 1:25.017 round the International circuit – some way off pole at this track last October, but it was cold yesterday, and it’s early days with the new tyres. 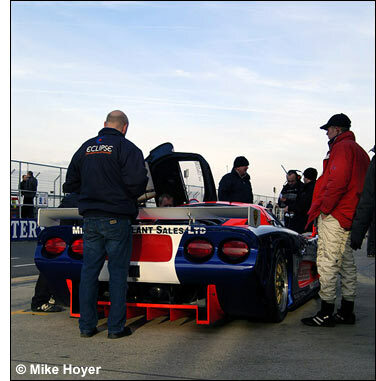 John Griffiths and his team have completely rebuilt the car over the winter, and introduced some tweaks and mods. 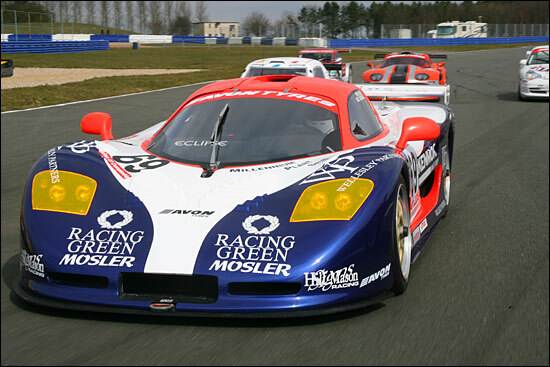 of their own – and with Keen and Caroline in the Eclipse Mosler, expect a very serious challenge for honours. 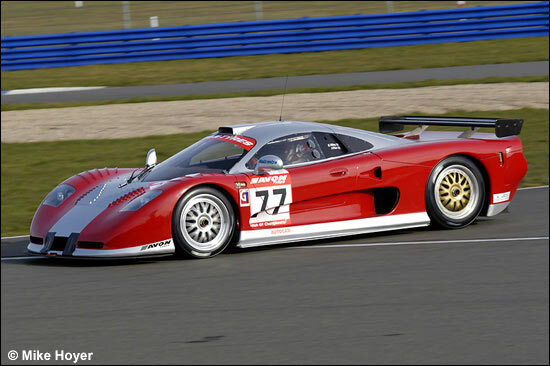 Think back to 2004, switch to a Mosler, add more pace, stir – and it will be fascinating to see how this entry performs once the racing season gets underway. And how it performs against Kevin Riley’s car. The car owner had his first proper drive on Wednesday afternoon, although he had to be patient while Martin Short bedded in the rebuilt machine, made some adjustments, sorted the mapping etc. Riley’s 2006 partner Ian Flux was absent (overseas) yesterday, but we know Fluxie’s pace – but Riley was into the 1:29s very quickly yesterday (on his first flying lap!). But then he does have experience of some powerful machinery. 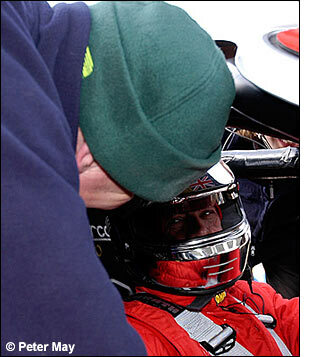 Kevin Riley returned to racing for the Ferrari Challenge in 2004, and his wife Pauline reckons that this is “his second childhood”. Martin Short (in the green headgear, left) commented that his Rollcentre crew has spent “four weeks on the car, binging it up to spec., so this is a shakedown: it’s the car’s first run in the dry”. There was certainly no intention to go for times at the test day, but Kevin Riley is more than happy with his Rollcentre-tended MT900R. 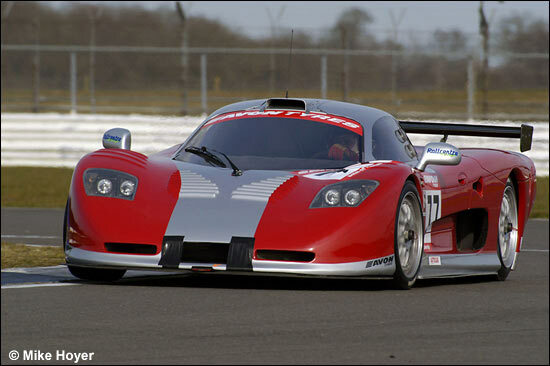 We’ll see what he and Ian Flux can do with it at Oulton Park next month.